Navajo history and specifically, Navajo weaving history, is centuries old. The Navajo people began arriving in what is now the United states in approximately 1100AD. They were originally nomadic hunters and gatherers drifting in small bands. Somewhere between 1100 and 1500, they finally settled in an area now known as the Four Corners, where the Southwestern states of Mexico, Colorado, Utah, and Arizona meet. The Navajos are related to Asian people by physique and language and they share a kinship with the Athapascan tribes of Western Canada and interior Alaska. The Alaskan Athapascans had practiced the art of weaving and it is thought by some historians the Navajos may have had some knowledge of the skill from these ancestors. By the time the Spaniards arrived in the 1500s, many of the Indians of the Southwest were already weaving some cotton clothing as well as nets, mats, sandals, etc. History has shown they knew all about cotton and how to grow, card, spin, and weave it. The Spaniards introduced wool to the Indians. They brought churro type sheep as well as horses to the Pueblos and their neighbors, the Navajos. The more sedentary type of Indians such as the Pueblos became skilled in pottery and basket making, because the materials were readily available on the land, and their supplies and finished work didn’t need to be moved from one place to another. Because the Navajos were semi-nomadic, they instead concentrated on the skills of sheep herding and making their own wool, which they learned from the Spanish settlers. Since the Navajos were semi-nomadic, they didn’t accumulate household and other goods and they were able to move freely about the area. Thus, they were able to avoid much of the subjugation of the Spaniards and Franciscans who came to ‘Christianize’ and ‘civilize’ the Indians of the Southwest. The sedentary Pueblos, though, were an easy mark. The year 1680 saw the entire Pueblo population of New Mexico and Arizona rise up and rebel against the Spaniards, pushing them out of their territory. Afterwards, the Pueblos, fearing retaliation from Spain, sought refuge with the Navajos, even though the Navajos and the Pueblos had raided and attacked each other for centuries. The Navajos were well-known for stealing sheep from other Indians (especially the Pueblo) and fiercely guarding their flocks. It is a strange twist of fate that if the Navajos had not stolen sheep and horses from other Indian tribes, those Indians would not have had the availability of sheep later on since their livestock had been almost completely destroyed by the invading Spaniards. Although they were not allies, the Pueblos and the Navajos were able to maintain a period of peaceful coexistence, even intermarrying. It was during this period, in the late 1600s that history supposes the Navajos learned the skill of weaving from the Pueblos. As mentioned above, they may have already had a measure of skill in that art. The Pueblo men had been the cotton cultivators and so they became the weavers. The Navajo culture, on the other hand, saw hunting as belonging to the men and the care of the sheep and the weaving was given to the women. Gradually, the women even came to own the sheep. Whether or not the Navajos learned the skill of weaving from the Pueblos or their ancestors, it can be said without doubt, by the mid-1700s, their weaving had far surpassed that of the Pueblo and the Spanish as well. The Navajo legend of weaving relates the story of a spiritual being called 'Spider Woman' who instructed the women of the Navajo how to weave on a loom 'Spider Man' told them how to make. 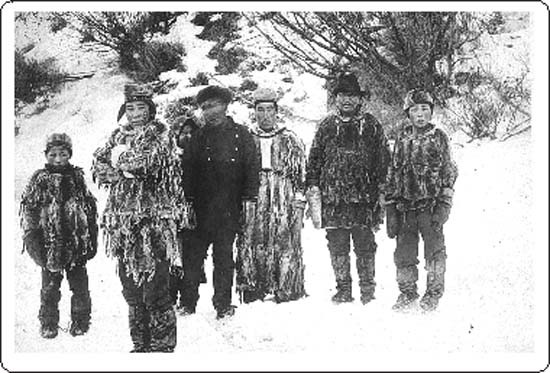 The mid 1700s saw the Navajos using the wool from their sheep in their weaving of clothing, blankets, ponchos, etc. The patterns were simple and consisted primarily of narrow stripes and bands. The colors were usually natural wool tones of white gray, brown, tan, and black. Vegetal dying was also used for hues of rust, yellow, and green. Indigo blue had already been introduced by the Spanish and was used throughout this period. Blankets woven by the Navajo were traded on a small scale to the Spanish, Pueblos, and other Indians. Toward the end of this period, in the mid-1800s, a large number of Navajo women were captured and sent to private homes and fabric factories in Mexico. They were enslaved and made to weave whatever they were told. A type of ‘slave blanket’ emerged from this captivity that was more Mexican in style than Navajo. The result of early Navajo weaving was the highly prized and widely sought after Navajo blanket, which they wore for their own use and traded to other Indians such as the Sioux, the Cheyenne and the Ute. These Navajo blankets were already being supplied to the Spanish and to other Indians, but by 1850, they were also being supplied to the American traders and settlers. These blankets were beautiful and lighter than buffalo skins and were used as coats by day and blankets by night. The Navajo blankets were very expensive for their time and were called ‘chief’s blankets’ by the Indians and the traders because of their expense, so only chiefs (Navajos did not have chiefs) and other wealthy people could afford to own them. It was also said the stripe pattern, when worn by the chiefs, made them look taller. Although the patterns were relatively simple, the spinning and weaving became more technically superior and, as a result, more easy to trade. Please go to Navajo Chiefs Blankets for more information. The year 1863 almost saw the extinction of the Navajo nation. The US government had failed to conquer and subjugate the Navajo and convert them back to agriculture. Kit Carson used a ‘scorched earth’ attempt to overpower the Navajo who had allegedly raided American and Mexican settlements. Their livestock, crops, and homes were destroyed and they were forced to march 350 miles to Bosque Redondo in East-Central New Mexico. Here they were kept captive and an attempt was made to suppress their culture. While in captivity, the weavers, deprived of their native wool, began to use the machine-made yarn their captors supplied to them to continue to make blankets. Fortunately, they were released and allowed to return to their reservation in 1868 when the cost of feeding them became too much for the government. Tragically, only 12,000 of the tribe had survived and it took the Navajos until 1930 to increase their population and restore their livestock industry. It was the Chief blanket that began the Classic Period of Navajo weaving. But the rise of the railroad in the 1880s changed traditional Navajo life forever. The Navajo Chief blanket was quickly replaced by cheap manufactured blankets that came by train from Pennsylvania (Pendleton). As the 20th century approached, Indian traders set up outposts of goods which provided a stimulus to the Navajos and a new market for their weaving. Unfortunately, the end of the transitional period saw a general period of decline in workmanship in Navajo weaving. The designs were not precise and the colors became gaudy as well. Buyers and tourists in the area began to demand Navajo blankets which could be used on the floor as rugs. A heavier type of weaving would be required to produce these rugs and the Navajos started developing new designs for the trade. Weavers returned to their hand spun wool with new ideas stimulated by the traders. The Navajo weaving industry began to regain its pride and excellence. Traders, such as Juan Lorenzo Hubbell of Ganado, Arizona and John B. Moore of Crystal, New Mexico realized the potential of Navajo rugs and were instrumental in helping to develop new designs with quality weaving. 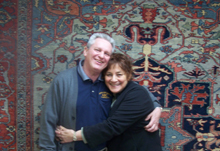 For the first time, a bordered rug was experimented with because it was favored by eastern buyers. There was also a return to Classic Period designs such as crosses, stripes, and diamonds on a red background bordered in black. Hubbell, Moore, and other traders commissioned artists to paint rug patterns as samples for the Navajos to copy. Around 1910, the US government brought in French Rambouillet sheep to the Reservation, hoping to increase meat and fleece production. But the wool was difficult to clean, was oily and short, and the quality of the rugs decreased dramatically and the weavers lost interest around the end of this period. This is when the traders started buying rugs by the pound in order to stimulate production. 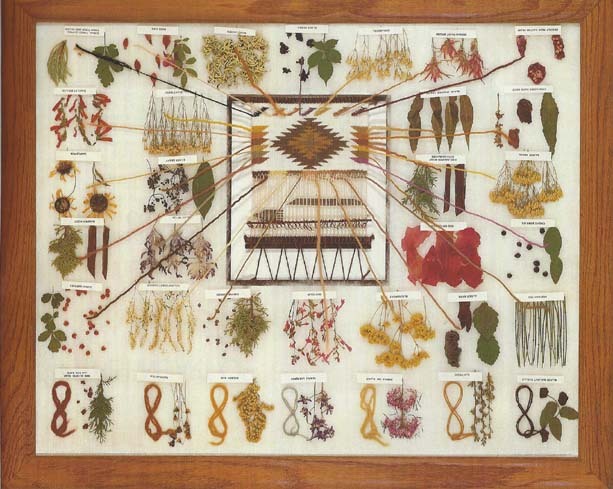 The answer of the Navajos weavers was to weave with wool that still had grease and dirt in it. The dirtier the rug, the more it weighed and the more money the weavers were able to take home. A return to the use of old, natural dyes and the return to the stripes and bands of the classic period, combined with the improvement of the fleece of the Rambouillet sheep in this period led to a great revival of Navajo rug weaving. A good amount of the credit for this is given to Leon McSparron of the Chinle Trading Post. Navajo chiefs rugs are Navajo rugs that are made in a chief's blanket pattern but use heavy yarn and are actually Navajo rugs, not blankets. Even though they may be sold as ‘blankets,’ they are really old copies of the original Navajo blankets. These occurred from 1900 to the 1940s. Designs early in this period were associated with the area in which they were made. These included Ganado, Two Grey Hills, Teec Nos Pos, Chinle, new Crystal, Wide Ruins, and others. The Navajo weavers of today travel all over their region and their weaving tradition has produced a valuable art form prized all over the world. Navajo rug styles are still evolving. A ‘new style Crystal’ is very different from an old style Crystal. 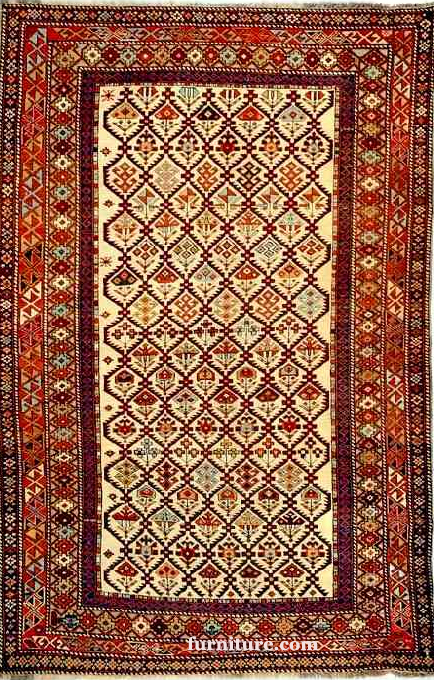 Today, a rug exhibiting a particular regional style may have been woven in any region. But although geographical names may not any longer guarantee origin, the terms are still useful. Many traditional weavers (some men as well as women) still depend entirely upon their own resources. They raise their own sheep and shear, wash, card, and spin the wool themselves. They dye with native plants or use the wool in its natural colors. Navajo weaving history has seen its ups and downs but it has miraculously persevered, just like its people and their culture. Their love of beauty is reflected in their rug weaving. The Navajos are a deeply spiritual people who have been terribly maligned in this country (as have their other native brothers and sisters). Regardless, they have never lost their pride and have remained as close as possible to their cultural traditions and lifestyle. 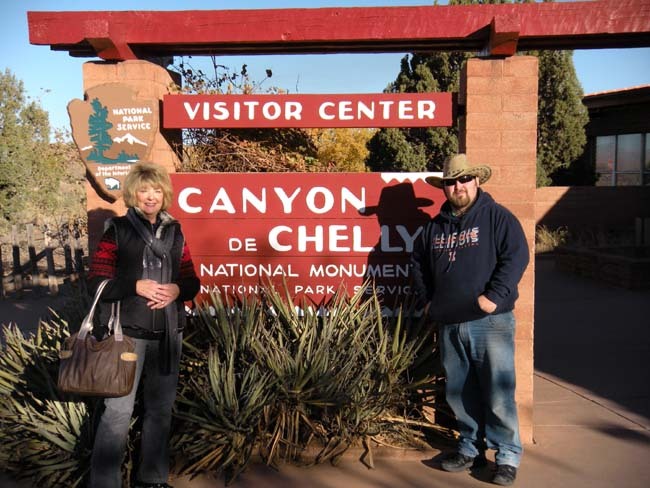 A tour through the Navajo reservation is always a wonderful way to get closer to the people and their culture as well as the amazing world of Navajo weaving.